Following West Ham’s defeat at home to Newcastle on the 18th January, relegation for the Hammers seemed a real possibility as they sat in 18th position in the league. Their total of just 18 league points from their first 22 games was the joint lowest in the league; this honour was shared with Sunderland and Cardiff. The following chart plots their cumulative goal difference and their cumulative expected goal difference, based on volume and quality of chances created and conceded. Actual goal difference is in blue, with the expected goal difference shown in red. As can be seen at that point in time (mid January), our model would suggest that West Ham could count themselves pretty unfortunate to have a goal difference of -11. We would suggest that a net goal difference of -5 might have been closer to a deserved return during their opening 22 games. That Newcastle game was the first time that Andy Carroll had played more than 30 minutes in a match this season as the big striker took longer that initially thought in his recovery from a heel injury suffered in the final game of last season. “It’s a bit scary to think where we might be if we’d had Andy all season. We didn’t have him all season last season and finished 10th; we have had him even less this season. “We are now 11th, we are one point behind our last year total, so we have 37 points and this time last year, we had 38, we have had our best run of results since we have been back in the Premier League. “Since Andy and the other players got fit – and I always said coming on the back of January, ‘Once our players are all fit, watch out, we will be okay, we will win football matches’. The narrative would certainly back up Allardyce’s claims that it has been the return of Carroll, and some other injured players, that has been the catalyst for West Ham’s rapid ascent up the table. But is there a chance that we are being told a story that simply fits with the results? You will recall from the chart above that West Ham were arguably playing better than their results suggested at the point Andy Carroll returned from injury. 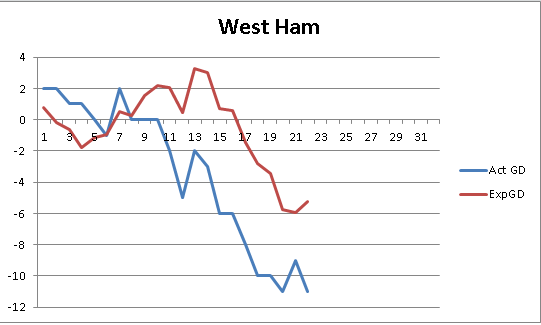 Despite their great results, West Ham’s expected goal difference per our model has continued to decrease further into the red since mid January. On the other hand, their actual goal difference has seen such a turnaround in fortunes that it is now 6 goals better off than their cumulative expected goal difference. Over the course of their last 10 league games West Ham enjoyed a +5 goal difference, compared with an expected goal difference of -7. In fact, of those 10 games I would suggest that in 6 of them they obtained results that were in excess of 1.5 goals better than the performances would have suggest they should have earned. Such examples include the 0-0 draw at Stamford Bridge as well the 2 goal victories over Norwich, Swansea and Aston Villa in early February. Incidentally, Carroll missed two of these victories following his red card received in West Ham’s victory over Swansea. We have to be careful not to allow our opinions to be formed by popular narratives. Too often these narratives are lazy and they simply fit the results and the prevailing mood of the media thus masking the underlying story. Just like in the Tottenham article I wrote last month, it is important that the decision makers at clubs are able to detach themselves from raw results as well the mood of the wider public if they are to act in the best interests of their football club. 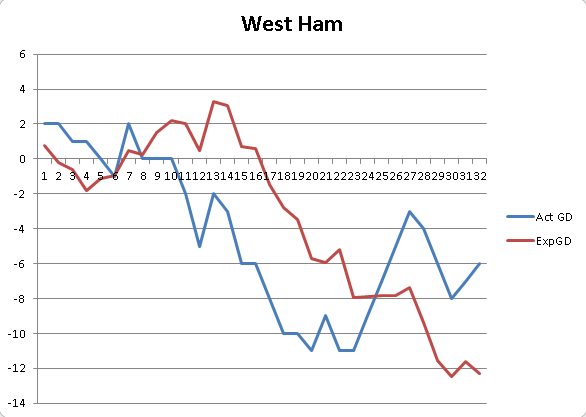 Analysis of the data in mid January would have suggested that West Ham were due an upturn in their fortunes. We have seen that Allardyce has put the improved results down to the return of the injured players, most notably Carroll. I’m not so sure that it’s as simple this. In my opinion they have hit a hot streak at the perfect time, both for the club in terms of securing their top flight status, and for Andy Carroll whose stock is at an incredibly high level just as plane tickets for Brazil are being handed out by Roy Hodgson. For all that Andy Carroll brings to this West Ham team, I feel that recognition needs to be given to the fact that West Ham weren’t as bad as they appeared in January, but also they probably aren’t as good as they now seem to be.